Happy Thursday to ya! 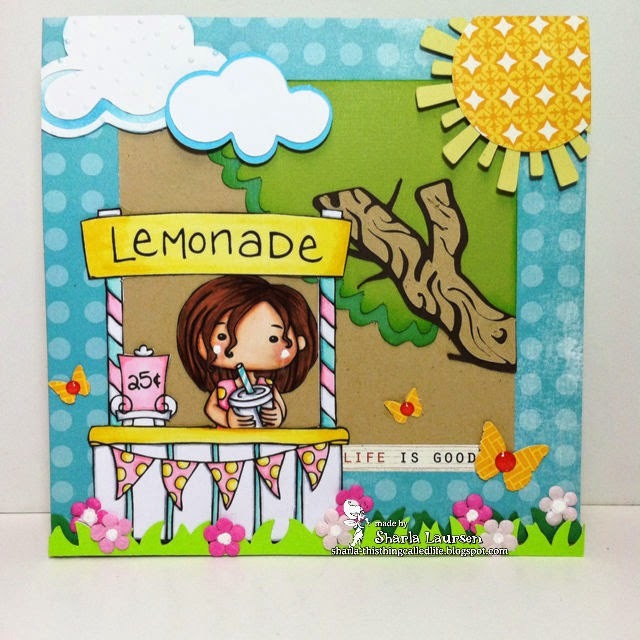 Over on the FB page for Little Miss Muffet Stamps we have a lot of inspiration going on, I have created this card using Polka Dot Pals Mitzi and Polka Dot Pals Lemonade Stand, I also used the sun, clouds and corner tree border from Miss Kate Cuttables. I think it adds for such a fun summery scene! Did anyone ever do lemonade stands when younger? I sometimes will see kids around town givin it a try, but I don't ever remembering doing it myself. I think Mitzi has the perfect stand that would attract many a customer though, and it looks like she is enjoying some refreshment herself! Hope you enjoy my card, these LMMS stamps and images are so much fun to play with, mix and match and create fun little scenes.